uenced vineyards throughout Sonoma County. Sonoma County has a little bit of everything – mountains, meadows, lakes, forests, pastures and valleys. Its weather ranges from cold and overcast along the coast to warm and clear at some of its inland mountain sites. The soils include marine deposits, clay, loam, volcanic rock and everything in between. In short, Sonoma has some of the most varied and complex terroir on earth. This versatility is the reason Sonoma County is capable of producing superior wine from virtually all of the world’s major and minor varieties. The key to our success has been our ability to match the proper variety to the proper terroir. Our 2005 Cabernet Sauvignon comes primarily from organic or sustainably-farmed vineyards along the benches, hillsides andmountains set in the morning shadow of the Mayacama Mountain Range. This area of eastern Sonoma County is ideal ground for Cabernet Sauvignon. It has the ability to fully ripen all of the Bordeaux varieties without sacricing elegance and structure. Its best wines are noteworthy for their concentration, style and character. Our 2005 Sonoma County Cabernet Sauvignon is deep, dense and highly aromatic. The nose is saturated with plums, cassis, currants, vanilla, earth and toast. The palate is intense and well supported by finely integrated tannins and balanced acidity. As with many of our Cabernet Sauvignons, this wine drinks beautifully in its youth and should continue to improve over the next decade. captures the character of each site, blending them to tell a story both of vintage, and of the distinct terroir that is Sonoma Valley. e use of Sonoma Valley hillside vineyards in this vintage gives structure to a particularly intense and concentrated Cabernet Sauvignon. is Cabernet has very rich aromas of cassis, black cherries and plums with nuances of toasty oak in the background. On the palate the wine shows its underlying depth of dark fruit. It is silky in texture with almost a sweet impression that lingers into a plethora of black fruits, cassis and a nuance of dark chocolate on the finish. Sonoma Valley is a bucolic setting of rolling hills, well-tended vineyards, and soaring oaks. Celebrating this special place, Arrowood Cabernet Sauvignon is crafted exclusively from vineyards neighboring Arrowood Winery. Mountain and hillside vineyard sites (many organically farmed) were thoughtfully sourced in anticipation of this wine. 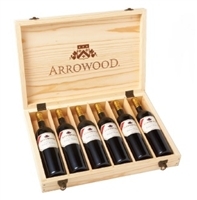 Arrowood Cabernet Sauvignon captures the character of each site, blending them to tell a story both of vintage and of the distinct terroir that is Sonoma Valley. The use of Sonoma Valley hillside vineyards gives structure to a particularly intense and concentrated Cabernet Sauvignon. This Cabernet has very rich aromas of cassis, black cherries, and plums with nuances of toasty oak in the background. On the palate, the wine shows its underlying depth of dark fruit. It is silky in texture with almost a sweet impression that lingers into a plethora of black fruits, cassis, and a nuance of dark chocolate on the finish.